The DeckMate is a heavy duty pallet prepping machine that hydraulically removes the damaged deckboards. 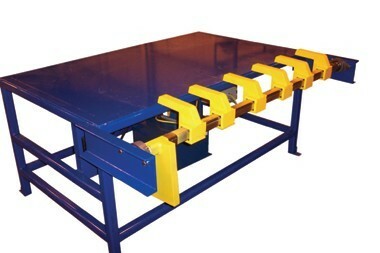 It can be used as a builder table or an inspection transfer table. This highly productive machine requires only one operator to make quality decisions regarding which boards should be removed from the pallet. The DeckMate flexibility allows this unit to be used in numerous line operations.